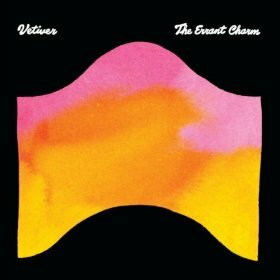 In turns wistful, earnest and contemplative, Vetiver’s fifth album, The Errant Charm, straying out of the folk comfort zone, boasts tracks that range from tranquil grooves to throwback light rock, all the while delivering candid lyrics and soothing melodies. Just as the title suggests, many of the tracks touch on the subject of traveling, whether lyrically–a lost love moving on, a hopeful soul moving towards a brighter day–or musically–with steady guitar rhythms that occasionally change in meter and with persistent and diversified percussive beats that are sporadically layered with rotating ambient sounds. At once restrained and emotive, front man Andy Cabic’s breathy voice, a perfect blend of whisper and purity, conjures feelings of nostalgia, unassumingly commanding the listener’s attention. The steady, yet relaxed pulse of the track “Worse for Wear” evokes images of a drifter, post-heartbreak, who has come to the realization that everything and everyone is in constant motion. The irony-laden lyric, “funny how you’ve already moved on,” tugs at your heartstrings as you root for the protagonist of this heavy-hearted narrative. The track “Can’t You Tell” exudes optimism and a sort of light-hearted expectancy without sounding at all manic or contrived. With inspiring lyrics such as “bright skies, let the sun warm its way to me,” this song should be declared an anthem for second chances. Hopefulness comes through in a satisfyingly understated manner with upbeat rhythms and low key lyrics. Reminiscent of a smoother, lighter rock from decades past, the track “Ride Ride Ride” throws a bit more attitude at the listener; complete with catchy guitar vamps and care-free lyrics, temptation to keep pushing that repeat button is strong. This track is sure to get toes tapping and perhaps even heads bopping as it takes on the tone of good, clean, old-fashioned rock music. Exhibiting a genre-crossing sound and timeless lyrics, Vetiver’s The Errant Charm is sure to experience longevity in the music world.